Discuss how you would feel living in a bachelor community with poor living and working conditions, and being separated from your family. The interviews feature family stories and emotional memories. Discuss the personal impact of the immigration restrictions. Give examples, from the film or from your own experience, of the immigrants’ ability to rise above these challenges and contribute to Canada’s development. Though this film is based on one particular community in British Columbia, discuss how the story of the immigrants and the immigration laws is really of national significance and why the impact of this story is important to all Canadians. Discuss the relevance of this film to your personal life, your school, your community. Discuss the film with members of the impacted communities, in your school, your neighbourhood, your church, temple or mosque. 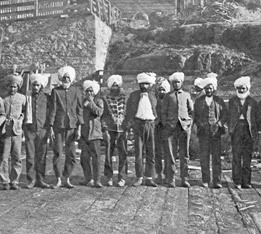 The Chinese and Sikh communities of Victoria, Vancouver, and Vancouver Island, as well as Toronto and Ottawa, have assisted in the preliminary research for the film, and have participated in the filming of interviews. A request for information and assistance in locating descendents of the Chinese workers has been posted on the Website of the Chinese Canadian Historical Society since 2006. Discuss the possiblity of finding more descendants of the workers of Tod Inlet now that the film is being screened across Canada. Provide feedback on the film’s message, content and creative approach to the film Director.